Technology is everywhere. Not only is it changing the way our businesses are run and our plans are made, but it’s also changing the way that our next generation is raised. From iPads and personal laptops in classrooms to cell phones in every pocket, students are rarely without the option of immediate entertainment and gratification. But is everything at their fingertips really the best thing for our next generation? Teachers and administrators recognize both the pros and cons of technology in the classroom. They are doing everything they can to use it to their advantage, but sometimes kids would just rather scroll social media than do anything else. Principal Zhang Pengfei of the Xi Guan Primary School felt tired of that and came up with something to change their minds. “According to regulations of the Ministry of Education, middle schools and primary schools should give students 25-30 minutes of free time in the morning to relax and exercise,” says the CCTV Video News Agency. The Xi Guan Primary School used these morning breaks to do calisthenics, but the students proved to be more than a little uninspired by the school’s routine. Actually, Pengfei started to notice that they were uninspired by nearly everything that wasn’t their electronic devices, so he came up with a plan. 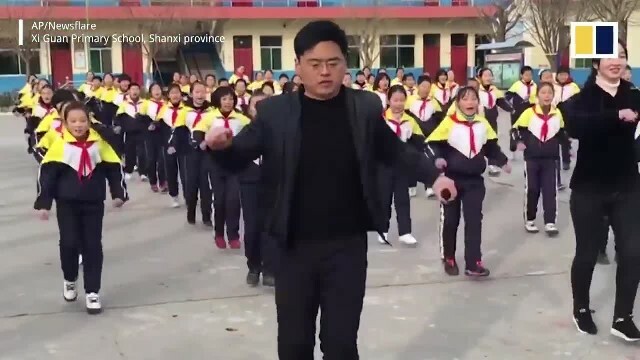 When this forty-year-old principal spotted an upbeat shuffle dance routine in a nearby public center, it all clicked for him. He learned the dance routine after hours of training and, shortly after, began sharing the routine with his students and teachers. They would replace their previous calisthenics exercise with the dance, something he believed that they could really get behind. The students reacted to the dance routine just as he’d expected. The teachers did too. Soon, they were all outside dancing along to the routine with smiles on their faces, and word began to spread. The South China Morning Post paid a visit to the school and recorded the smooth dance moves of the school, and it didn’t take long for the video to go viral. Thanks to this happy shuffling motion and the principals’ surprisingly rhythmic dance moves, the kids were finally having fun away from their cell phones. The dance garnered more than 250 million views on China’s largest social media platform, Weibo. The principal has been pleased to see the reaction from his students. Sure, he’s caught a few of them using their cell phones during school, but for the most part, they’re all searching for more dance routines, thus doing his job of making the school more active and promoting fun away from the internet. As this school has demonstrated, the internet is not the only thing that can make kids happy. Adults too. For this school, the virality of the dance certainly didn’t hurt either. We could all learn something from this incredible display of education at the Xi Guan Primary School. All we’ve got to do is put down social media for a while and see how we can perform together to come up with something that could last a lifetime. What did you do when you were in school that was a fun way to stay away from the internet?